OIL and CONFLICT: What Is the Link? Natural Resources and Conflict: What Is the Link? Unless a successful rebel organization is bankrolled by another country or an extensive and willing diaspora, it must generate income by operating some business activity alongside its military operations. The question then becomes the type of business activity in which a rebel group is likely to be competitive. Unfortunately, the obvious answer is that the rebel groups’ only competitive advantage is their large capacity for organized violence and mayhem. Since, for military reasons, rebel groups tend to be based in rural areas, they turn to business activities such as various forms of extortion and the exploitation and trade of primary commodities. Where rural areas produce primary commodities with high economic rents, generally for export, it is a relatively simple matter for rebel groups to run an extortion racket, levying protection charges on producers or carrying out some of the trade themselves. The bestknown examples are the conflict diamonds of Angola and Sierra Leone. Alluvial diamonds are particularly well suited as a business line for rebels because the technology is so simple that the group can directly enter the extraction process and diamonds are a small, high-value commodity that is easy to hide and transport and has a readily accessible international market.As Michael Ross discusses in chapter 2, a number of other commodities such as coltan, drugs, gold, and timber have, at various times, been linked with civil wars in developing countries. In the case of high-value agricultural exports, the rebel group is not directly involved in production but levies informal taxes on producers and traders. The most spectacular example is that of illegal drugs, which, because of their illegality, are very high value. But even lower-value export crops are sometimes the target of rebel extortion—the Revolutionary United Front in Sierra Leone started by levying informal taxes on coffee and only shifted its activities to diamonds once it was well established. 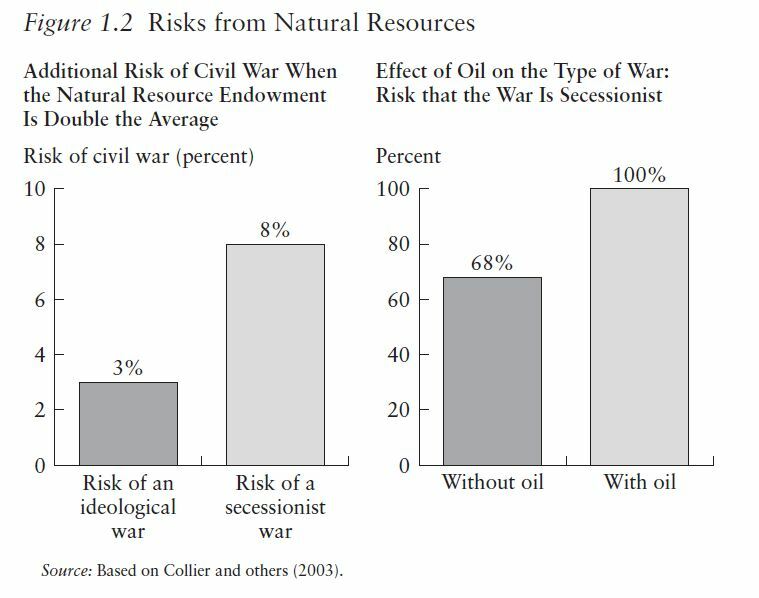 Violent secessionist movements are statistically much more likely if the country has valuable natural resources, with oil being especially dangerous. Examples include Aceh (Indonesia), Biafra (Nigeria), Cabinda (Angola), Katanga (ex-Congo), and West Papua (Indonesia). There is some evidence that rebel leaders greatly exaggerate the likely gains from controlling the resources. This exaggeration is in part strategic, as secessionist leaders simply seize on the resource issue to build support for their movement. For example, leaders of the GAM (Gerakan Aceh Merdeka) rebellion in Aceh propagated the notion that secession would turn the province into another Brunei. Ross (2002) estimates that this was more than a tenfold exaggeration. But leaders themselves may also succumb to the glamour of the riches to be had from natural resources and overestimate the likely windfalls. The discovery of a new natural resource or a higher endowment of a known resource greatly increases the risk of conflict in low-income countries, especially if the resource is oil (figure 1.2). In many such instances, ethnic cleavages can appear to cause the rebellion. In most societies, wherever a valuable resource is discovered, some particular ethnic group is living on top of it and has an incentive to assert its rights to secede. All ethnically differentiated societies have a few romantics who dream of creating an ethnically “pure” political entity, but the discovery of resources has the potential to transform such movements from the romantic fringe into an effective and violent secessionist movement.Although this type of secessionist movement appears ethnically based and cloaks its justification in the rhetoric of ethnic grievances, it would seem a mistake to consider ethnicity or religion as the driver of conflict. Poor governance and corruption can also exacerbate secessionist tendencies, especially if the secessionist group has a fighting chance of wresting control of a valuable natural resource. Where a region sees what it considers its resources stolen by a corrupt national elite comfortably ensconced in the capital, the prospect of gaining control over the natural resource revenues and using them for the benefit of the local ethnic majority can be a powerful driver for a secessionist movement. Kidnapping for ransom targeted at foreign extractive companies also can be a profitable business. In the 1990s kidnapping became the third largest source of financing for Colombia’s two rebel groups (National Liberation Army and Revolutionary Armed Forces of Colombia), after drugs and extortion. Kidnapping netted the Colombian guerrillas an estimated $1.5 billion during 1991–99, and these revenues have been rising. In 1999 the two groups are estimated to have received a combined $560 million from extortion and kidnapping (Pax Christi Netherlands 2001, pp. 33–34). A large number of kidnap victims are employees of foreign extractive industries. Oil companies are especially frequent kidnap targets, and in some regions kidnapping has become a regular routine for them. Rebel groups may also target foreign tourists for kidnapping, as has happened in the Philippines. Following each successful kidnapping, rebel recruitment soars, presumably because young men anticipate large payoffs. In Colombia rebel groups have combined with urban-based criminals to create a market in kidnapped people. Criminals undertake the kidnapping, selling the victim to the rebel group, which then demands ransom. Just as markets have emerged in some developing countries to trade kidnap victims, markets have emerged in developed countries to supply ransom insurance. Kidnap insurance, although understandable from a personal or business sense, has the perverse effect of reducing the incentive to protect workers from kidnapping, increasing the size of ransom payments, and lowering the transaction costs for the rebel group. In Colombia rebels are reputed to have, at times, gained access to insurance company data and thus been able to determine whether the actual or intended victim has kidnap insurance (Pax Christi Netherlands 2001, p. 30).